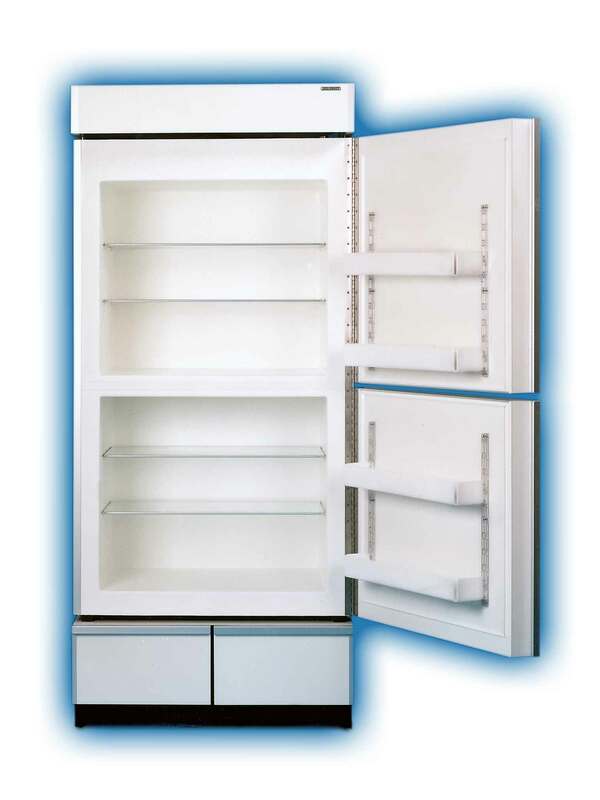 The Sun Frost RF19 refrigerator and freezer has one compartment that is a refrigerator and the other a freezer. The RF19 can be ordered with the freezer on the top or on the bottom. The freezer is twice as large as the freezer in the RF16; however, the refrigerator compartment is slightly smaller. The RF19 often eliminates the need to buy a separate freezer. Like the RF16 this model is typically mounted on a 13-inch high cabinet. The RF19 uses two quiet and highly efficient fans to cool the exterior cooling coils. Sun Frost refrigerators and freezers are so outstandingly energy-efficient, powering a home with solar power or other low output energy sources is both feasible and affordable. All models are available in 12, 24, 48 volt DC, or 110 or 220 volt AC. Even in a home using conventional utility power, energy consumption for refrigeration is typically cut by a factor of five! Every Sun Frost is custom crafted - you choose the hinge side and finish. Your Sun Frost can be finished with a number of laminate or wood finishes. Sun Frost is now also offering a stainless steel option. Voltage: All models are available in 12 volt DC, 24 volt DC, 48 volt DC, 110AC, or 220AC. Listed energy consumptions are for 12 volt units and 110AC; 24 volt units use half the listed amp hours. KWHs are listed for AC units. 48 volt DC: Please call for pricing. Clearance: The doors are mounted on a continuous stainless steel piano-style hinge. It is important to allow an additional 3.75" width on the hinge side for the door to open. All units require minimum 6" clearance above the unit to allow for heat ventilation. Also, PLEASE NOTE: Oak veneers add a quarter of an inch to overall exterior dimensions, all other wood veneers add a half an inch. Model RF19: Choice of Freezer on top or bottom. Unit has two equal size compartments. Colors: A wide variety of custom laminates and wood veneers are available for an additional $225 fee. Standard laminate color is white. Please inquire for stainless steel pricing.